Okay, here’s the deal. Processors of all types process chunks of data that are usually either 32 bits long, or 64 bits long. The only real reason that your modern puter has a 64-bit processor is because with a 32-bit processor, the machine can only address 4GB of “stuff” on the motherboard. 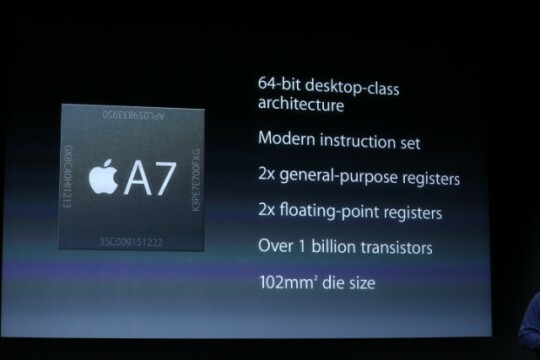 Um, it’s an ARM processor. It’s a smartphone processor. It’s not a desktop processor. But, “desktop-class architecture” sounds really good from the marketing POV, doesn’t it? OMG, are you kidding me? Are there any modern processors with ancient instructions sets?! Here’s where the real fun begins. You see, they can’t say, “2X the speed!” because it isn’t twice as fast. Instead, they pretend that having “2X” the registers on the processor is like some big fancy newfangled thing that makes the A7 super-awesome. There’s only one problem: All 64-bit processors generally have 64-bit registers (2 x 32 bits = 64 bits). When you widen the data bus to 64 bits, you need registers that are also 64-bits. Saying that the A7 has “2X the registers because it’s 64-bit” is like saying that a 16-valve 4-cylinder engine has “2X the valves of an 8-valve 4-cylinder”. Well, duh. That doesn’t necessarily translate into 2X the power, or 2X the torque, or 2X the efficiency. Put it another way: Do you even know what a register is? Most people don’t, and that’s the point. It’s marketing, and it’s really, really, really bad marketing. Now, you might argue that a 64-bit processor will naturally be faster than a 32-bit processor. This is for the most part one of the biggest misconceptions in the computing world. Have you ever used 64-bit Microsoft Office? And then have you compared it with 32-bit Office? I have, and guess what? It isn’t any faster when doing spreadsheet calculations, or typing in Word. There is no inherent benefit in having 64-bit-ness unless you are doing things that specifically require 64-bit operations/calculations, or you need lots of RAM. Otherwise, the only difference between 64-bit and 32-bit Office is that 64-bit Office takes up more RAM when running, and the installed program size is larger. Not very convenient for a smartphone with limited memory, eh? And then, let’s just think about this even more rationally… Do you really need a fully 64-bit app on a 64-bit processor to tweet or post Facebook updates or use Google Maps? Of course not. Even basic graphics and video is still 24 bits per pixel, which fits nicely into 32-bit chunks of data in a 32-bit processor. 64-bit graphics? HA! Of course, if you’re a heavy mobile gamer, you might see some performance improvements if the game is written to take advantage of them, but that’s the other catch. Just as in the desktop puter world, you can still run 32-bit apps on a 64-bit processor/OS. There isn’t any advantage there, either. And now we read that Samsung is also saying they’ll be coming out with 64-bit phones, too. Well, of course! They have a marketing department, too. What they should be showing is that the performance and features of their 32-bit smartphones running Android are still far better than the new iPhone. And what do the markets think about Apple’s “Next Big Awesome Thing”? 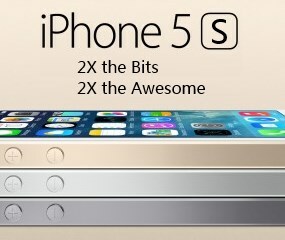 Well, if you really want to get an iPhone 5S so you can run around talking about how badass you are because you have The First 64-bit Smartphone in the World, then I won’t stop you. Just be advised that you are making a total fool of yourself. ← My Desktop Disappeared from Explorer: Quick Fix! IOW, they decided that since they couldn’t beat ’em, they’d join ’em with the whole “marketing gimmick” thing.